Two hundred years ago, during the late summer of 1815, 26-year-old William Cranch Bond unexpectedly spent a night on the steps of St. Paul’s Cathedral in London. Harvard’s emissary to Britain’s astronomers had gone to fetch travel funds from the University’s local agent, only to learn the man was away. But next morning, Bond managed to borrow money and took up his mission: inspecting the kingdom’s observatories and telescopes to help Harvard build a world-class astronomical facility. Bond was an unlikely embodiment of Harvard’s cosmic aspirations: a grade-school dropout, he had spent workdays in his father’s modest Boston shop, fabricating and repairing timepieces. But at night, he was a skilled amateur astronomer: the first U.S. observer to sight the faint, white blur that swelled into the Great Comet of 1811, a feat that led to his Harvard commission. The young nation was an astronomical wasteland. President John Quincy Adams, A.B. 1787, complained to Congress in 1825 that Europe had more than 130 observatories, while the United States had none. Harvard had prodded wealthy Bostonians four times to underwrite a research-grade telescope, without success. Meanwhile, Bond’s clock-making business flourished, its precision chronometers prized by New England shippers and the U.S. Navy. In 1819, his fortunes secure, he married his cousin Selina Cranch and settled into a large clapboard house at 158 East Cottage Street in Dorchester. The family parlor was sacrificed to astronomy, with a multi-ton, granite telescope pier emplaced in the floor and an observing aperture sawed through the ceiling. Smaller telescope-mounting stones dotted the yard, topped by Bond’s growing array of instruments obtained from Europe or lent by Harvard. 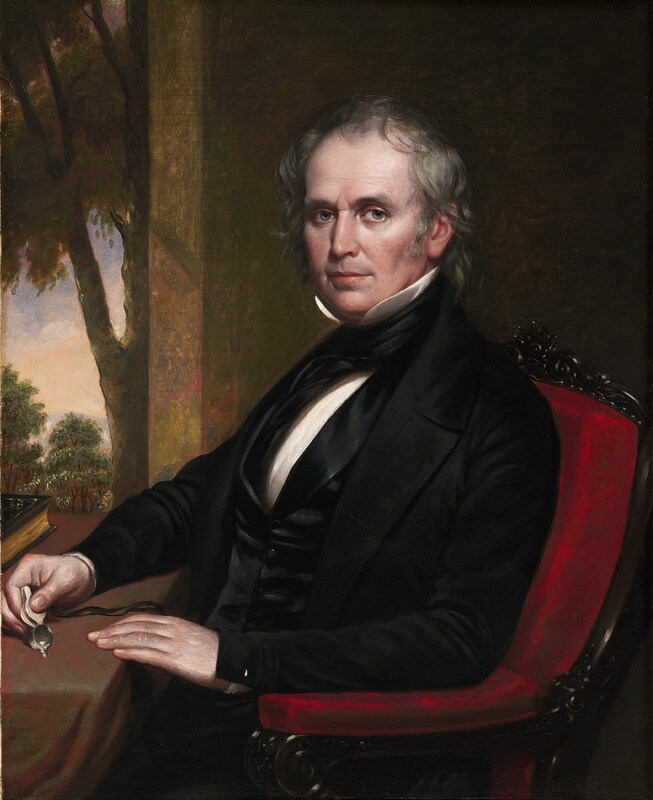 By the mid 1830s, his observatory had become the U.S. nexus of precision astronomy. So accurate was his celestial-based determination of his latitude and longitude that the navy’s 1838-1842 South Pacific exploration mission referenced the geographic coordinates of foreign ports not to Washington, D.C., but to Bond’s house. Four years into Bond’s appointment, the spectacular Comet of 1843 appeared, brightening until its tail could be seen in broad daylight. In its wake, Bostonians poured $35,000 into Harvard’s coffers to establish an observatory. On Bond’s recommendation, Harvard ordered a top-quality, 15-inch refractor telescope from Germany and acquired acreage for the facility on Summer-House (now Observatory) Hill, northwest of Harvard Yard. In 1844, the 55-year-old Bond transferred his family and his instruments to the bucolic grounds of the new Harvard College Observatory. He continued to work without pay until Harvard learned in 1846 that the Naval Observatory was trying to recruit him. He promptly received an annual salary of $1,500, plus a $640 stipend for his son George, by this time his devoted assistant. Harvard’s gleaming new telescope lens arrived from Germany soon after and was installed in a sleek, mahogany-faced tube. In June 1847, the instrument was secured to a massive granite pier, sheltered under a 30-foot, copper-clad dome that revolved on eight cannonballs. The crystal-clear views of heavenly bodies exceeded expectations. “The revelation was sublime,” Bond wrote of his first glimpse of the Orion Nebula. “It is delightful to see the stars brought out which have been hid in mysterious light from the human eye, since the creation.” For two decades, the “Great Refractor” reigned as the nation’s largest telescope. Among its discoveries were Saturn’s eighth moon, Hyperion, and that planet’s diaphanous crepe ring. Equally significant were Bond’s seminal experiments in celestial photography, at the behest of Boston daguerreotypist John Adams Whipple. In 1850, a 90-second exposure of Vega yielded the first photograph of any star other than the sun. The following year, Bond and Whipple’s daguerreotype of the moon created a sensation at the international exhibition held in London’s Crystal Palace. When Bond died, his son George became director of the observatory, remaining true to his father’s credo: “An astronomical observer to be useful in his vocation should give up the world, he must have a good eye, a delicate touch, and above all, entire devotion to the pursuit.” Today’s Harvard-Smithsonian Center for Astrophysics is the legacy of a Dorchester clockmaker who selflessly strove to make Harvard the hub of scientific exploration of the universe. Alan Hirshfeld, professor of physics at the University of Massachusetts Dartmouth, is an associate of the Harvard College Observatory and the author most recently of Starlight Detectives: How Astronomers, Inventors, and Eccentrics Discovered the Modern Universe.